IBM experts recognize the need for data protection, both from hardware or software failures, and also from physical relocation of hardware, theft, and retasking of existing hardware. The IBM DS8880 supports encryption-capable hard disk drives (HDDs) and flash drives. These Full Disk Encryption (FDE) drive sets are used with key management services that are provided by IBM Security Key Lifecycle Manager software or Gemalto SafeNet KeySecure to allow encryption for data at rest on a DS8880. Use of encryption technology involves several considerations that are critical for you to understand to maintain the security and accessibility of encrypted data. The IBM Security Key Lifecycle Manager software also supports Transparent Cloud Tiering (TCT) data object encryption, which is part of this publication. With TCT encryption, data is encrypted before it is transmitted to the Cloud. The data remains encrypted in cloud storage and is decrypted after it is transmitted back to the DS8000®. This IBM Redpaper™ publication contains information that can help storage administrators plan for disk and TCT data object encryption. 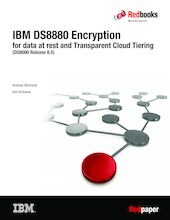 It also explains how to install and manage the encrypted storage and how to comply with IBM requirements for using the IBM DS8000 encrypted disk storage system. This edition focuses on IBM Security Key Lifecycle Manager Version 3.0 which enables support Key Management Interoperability Protocol (KMIP) with the DS8000 Release 8.5 code or later and updated GUI for encryption functions. The publication also discusses support for data at rest encryption with Gemalto SafeNet KeySecure Version 8.3.2.